Version 4 of the Automotive Industry Guideline (AIG) on REACH has been published by the automotive Task Force on REACH (TF-REACH) on 3 July 2018. 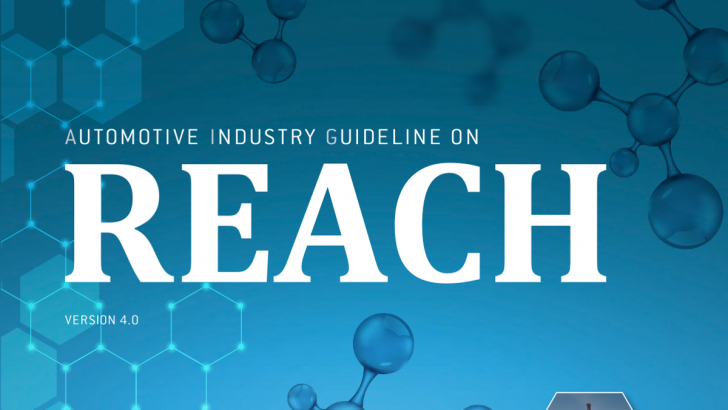 The latest version of the Automotive Industry Guideline on REACH can be downloaded by clicking here. TF-REACH comprises representatives of all the major vehicle manufacturers and the automotive supply chain. The TF recommends a common schedule and external communication strategy in order to harmonise the sector's response to REACH and avoid duplication and confusion by taking into consideration the automotive industry’s specific criteria and tools. The TF’s approach and recommendations are outlined in the new Automotive Industry Guideline (AIG) on REACH. (*) Glossary of terms; Notification of Candidate List substances in articles; Communication requirements for Candidate List substances in articles; Authorisation procedure. (*) REACH Substance Scrutiny – From PACT Onwards; REACH Annex XVII Impact Evaluation List; Practical Application of the O5A Principle for CL Substances in Articles; Sustainable Substitution Criteria; History of amendments to REACH Regulation; List of changes to AIG. The AIG will be translated into Chinese, French, Japanese and Korean, so as to assist the global automotive supply chain in understanding their REACH obligations while also providing useful recommendations.